A big welcome to everyone visiting the brand spanking new site! Here you will find information about our games as well as be able to read about their development. We are looking forward to learning, having fun, and most importantly making great games. Check back soon for more! Say you want to draw a full screen quad in clip space. The straight forward way to do it is to draw two triangles to cover the viewport. But why waste two triangles when you can do the very same thing with just one? Drawing a triangle with vertices a, b and c covers the entire screen. 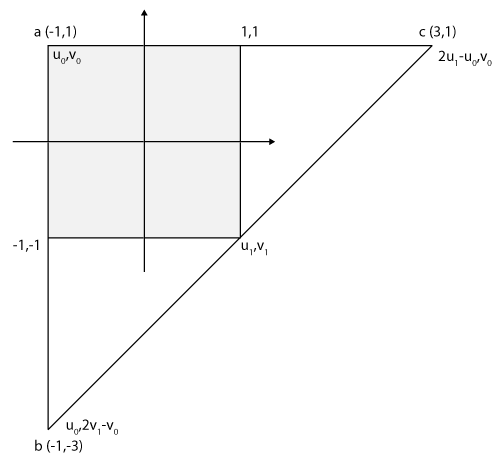 To interpolate a parameter across the quad so that it has values u0,v0 and u1,v1 at the opposite corners of the quad, set the parameter values on the three vertices as in the diagram above and in the table below. The code segment above is meant as an illustration and won’t necessarily work as expected. It is possible to have the compiler combine all copies of identical string literals via “string pooling” using the /GF option in MSVC(I think GCC pools strings by default.) With pooling, the code above will work as expected but it only takes care of string literals. What about dynamically allocated strings? // from any other kind of string. // The string pool that will hold instances of interned strings. // And this would be true. This is all neat and nice, but why would we want to do this? Only one copy of each unique string – Kuiper 2 uses a data driven approach for all of the in game assets. All scenes, textures, shaders, sound effects, pieces of text and everything else has an internal name that can be referenced by the engine. Interning the names means only one copy of each name is around. Fast string comparisons – This is related to the previous point. Since there is only one copy of each name, finding named objects and comparing names can be done very quickly! It’s as fast as comparing pointers and games are supposed to be fast. Warm and fuzzy feelings – It feels great knowing that all your strings are in one place. Now for the dirty bit! // Hash for C strings. I think I got this from boost. // Predicate for comparing strings by value. // they were strings and not pointers. // String not found so place it into the set. // Forward all calls to the PIMPL. That’s all there is to internalizing strings. In a future post I will talk about how to use a memory pool to keep all strings allocated in the same memory area. In Kuiper the player’s ship has a trail of gems following it as it flies about. To achieve this effect we need two things. First, the position information of the player has to be collected every frame. Second, we need to be able to place objects evenly along an arbitrary path. This part is pretty straight forward because all we need to do is store the player’s position in some sort of array or list. In Kuiper there is a queue that stores the historical position data. This works well as new positions are added to the back of the queue and old positions are popped off the front. If the ship flew around on a plane or didn’t require interpolation, a list of positions would be sufficient. 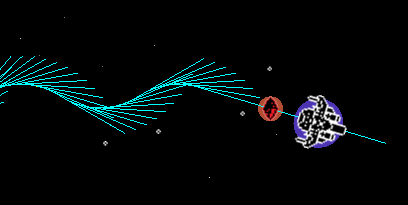 In Kuiper the ship flies around on the surface of a torus which is simulated by wrapping the player to the opposite side of the world when they fly out of bounds. Additionally the position of all the objects is smoothed for display in between physics updates. This can cause a problem during the frame that the player jumps to the opposite side of the world because the interpolation will make the ship appear to fly right across the screen! To remedy this we will also store the ship’s velocity at each frame and use it to calculate what the next, unwrapped, position should be for interpolation. The math library I use is called GLM. // the first object in the history. // Start from the most recent history sample. // Loop over all crystals that have been picked up. // frame of the history sample. // position it will be at the next frame. // Reset the spacing and break to move on to the next crystal. // Take another step along the historical path. In the Point in Polygon Test post we used a Ray-Line Segment intersection test in order to figure out how many sides of the polygon intersected a test ray. This post will explain how that test was derived. Find out if a ray with origin and direction intersects a line segment with end points and . This problem can be converted into a Ray-Ray intersection problem if you turn the line segment into a ray with origin and direction but we are not going to do that. Well we are, but not explicitly. Checking if two things intersect involves finding out if they share at least one common point. The first step is to express the ray and the line segment as sets of points. Next we can set the two equations to be equal and find the values of and . Since there are two dimensions the equality can be split into the and counterparts and give us two equations to solve for the two unknowns. Once and are calculated the ray and the segment intersect if and . Under these conditions the point of intersection is on both the ray and the line segment. The symmetry is pretty cool!